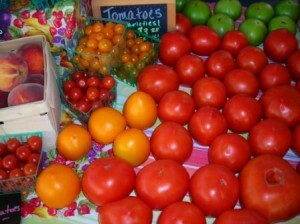 Tomatoes, tomatoes, tomatoes…. what a bounty we have right now. We will have many varieties too choose from; Cherokee Purple, German Pink, Mr. Stripie, Super Beefsteak, Carolina Gold… just to name a few; stop by and see Kenny’s unique collection. We will have canning tomatoes available on a pre-order basis only… be sure to place your order if you are wanting to make homemade salsa, pasta sauce or your favorite recipes. Peaches are still available but are beginning to slow down in abundance. We hope to have some through August depending on the weather. 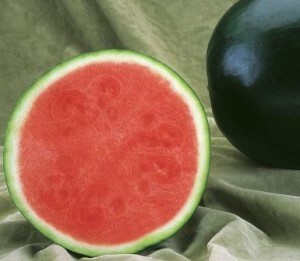 We are having a great melons harvest… watermelons and cantaloupes and they are both delicious! One of his most beautiful melons is imagination. This near black watermelon shines like a bowling ball and has a deep red flesh. It’s absolutely gorgeous to display, and it sells itself with its delicious taste. We are now producing enough fresh produce that we have started taking order for our “Basket of the Week”, it includes a little bit of everything available the current week, “Grower’s choice” of course. The “Weekly Basket” cost $25 and always includes fruit when available. If you are interested, talk to me at the market. You can e-mail me with any questions or to place an order. If anyone wants to pre-order to have their fruit and veggies ready for pick up, just e-mail me and let me know early Friday. I will have your order ready when you arrive Saturday morning (that way you can sleep in, work out or just plain work and still get what you want before we run out). Don’t forget we have farm-fresh, free-range eggs available; pick some up at the market Saturday.